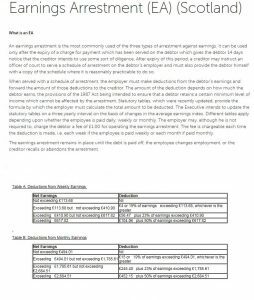 Scottish Trust Deed’s ultimate guide to preventing or stopping a Direct Earnings Attachment (DEA) in Scotland. Have you received a letter from a Sheriff Officer in Scotland stating their next action is to impose a Direct Earnings Arrestment (DEA)? Ok so nobody wants to receive their payslip from their employer to find out that one your employer has been informed to take money from your earnings due to an unpaid debt & also the stress of getting less money than normal come pay day. How to stop a wage arrestment in Scotland? The majority of people we speak to each day in debt who receive such letters generally have a debt or debts regarding council tax arrears, as local councils in Scotland step up the chase to get money owed recovered and can be go to some extreme measures to do this such as arresting someone earnings, affordable or not. How much (what percentage) or your wages can the Sheriff Officers arrest? Direct Earning’s Arrestment Deduction Table for Scotland. How will your my employer react? Who can have their earnings arrested? 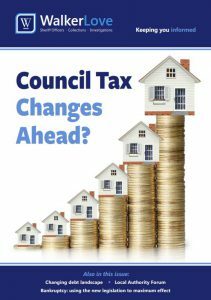 This entry was posted in Uncategorized and tagged Council tax arrears, dea, direct earnings arrestment, employer debt, Local council debts, payment plan, scottish protected trust deed, Sheriff Officers, wage arrestment on September 4, 2018 by Stuart Stirling.